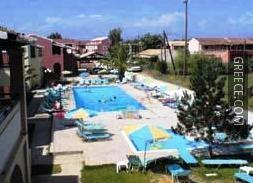 The Sellas Hotel is a budget hotel on Corfu's beachfront. This hotel is conveniently situated in the city centre. The Sellas Hotel provides a number of amenities including a sun deck, a swimming pool and a sun tanning bed. Also available to guests are a convenience store, shops and a safe. All the spacious rooms at the Sellas Hotel include a kitchen, a refrigerator and tea and coffee making facilities. An in-room closet, a TV and double beds can be found in each room. Standard inclusions to the en suite are a shower and towels. Guests can wake up to an English or a continental breakfast each morning, before setting off for a day of sightseeing in Corfu. Guests can enjoy a drink and relax in the hotel's bar. A wide selection of cafés and restaurants are also available in the area. The Sellas Hotel is conveniently located for sightseeing in Corfu with Museum of Asian Art only 10 minutes away. The hotel is situated within a 20-minute stroll from the Palace of St Michael and St George and the Old Town of Corfu.